The Kelly Kettle makes it quick and easy to boil water with minimal fuel in about 3 to 5 minutes. With the items in these kits, you can also use the Kelly Kettles for cooking and grilling. The Kelly Kettle was developed by the Kelly family in Ireland over 100 years ago, so they have some experience building these handy items. Any natural fuel can be used – from pine cones and sticks to dried dung (although I'd probably skip grilling over the dung…). Just build a fire in the base, put kettle in place, light it up, and in a matter of minutes you have boiling water. They work great in extreme weather conditions because the fire is protected by the Kelly Kettle. And of course – Emergency Preparedness and Survival Use. You can check out the Kelly Kettle in action in the video below. With the compact size and small amount of fuel used, I bet my brother could even use this in his hunting blind during deer season. The Kelly Kettles are available in three (3) sizes made from aluminum or stainless steel. Scout Medium Kettle: This kettle holds 44 oz or about 5 ½ cups and is available ONLY in aluminum. Trekker Small Kettle: This kettle holds 17oz or about 2 cups and is available in aluminum and stainless steel. Also available for use with the Kettles is the Cook Set made of stainless steel. This accessory is great for heating food over the top of the kettle and for cooking some foods over the fire in the base. The Ultimate Stainless Base Camp Kit includes the SST Large Base Camp, Storage Bag, Large Cookset, Pot Support, Hobo Stove and Camp Cups. Also includes 2 Solar Nokero lights for FREE, a $30 value! 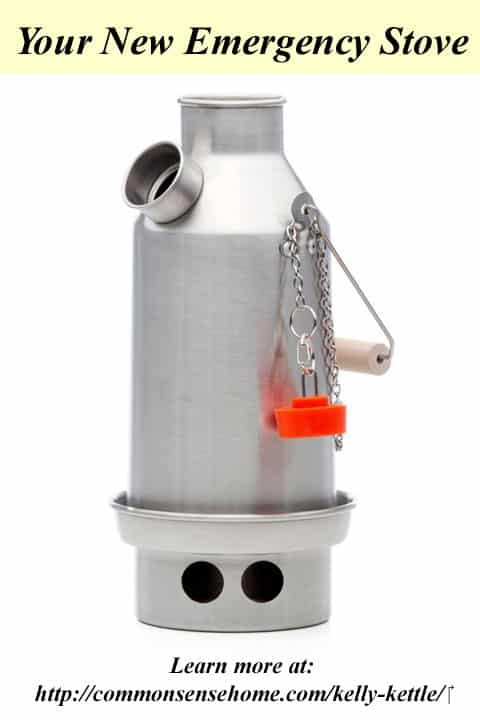 The Stainless Small Trekker Complete Kit includes Kelly's “mini” version of our popular Volcano Kettle. Compact & lightweight boiling approx. 19 oz. of water within a matter of minutes. 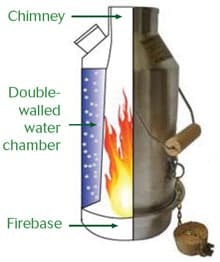 Simply refill and reboil on the same fire if more water is needed. Comes complete with the kettle, small cookset and pot support. The kettle only weighs 1.7lbs. Would be a wonderful birthday gift! My birthday is on the 18th. I love camping! I entered! Thanks!